You will not find better activities than camping specially during the summer breaks. If you happen to have a family of 4-6 members then this 6 person tent can be one of the handy items to take to your camping trip. 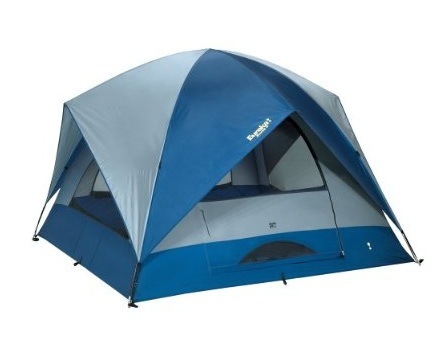 It is a spacious family camping tent having enough space to accommodate up to 6 people. It has a maximum height of 7 feet from the center and has a dome style head. The tent measures 11 feet by 11 feet which is almost 121 square foot area, more than enough for a small to medium size family. Unlike other large and bulky family tents, this is not that heavy either. It only weighs 23 pounds and when completely packed, it measures 8 x 33 inches which is very convenient to carry as well. The floor size of this 6 person tent is 11 x 11 feet. The wall fabrics are made of 1.9 ounce Polyester Taffeta 1200mm coating/1.9 ounce breathable polyester. The fly fabric is 1.9 ounce 75D Storm Shield polyester with 1200mm coating and the floor fabric is 4 ounce 210D Oxford Polyester with 1200mm coating. This family tent is made for 3 seasons and is one smart choice for those who want to use it frequently. Not surprisingly, this 6 person tent also includes corner organizer, wall organizer with a set of mirrors and two water bottle pockets. The multicoated storm shield made from polyester will not lose its shape when exposed to continuous sunlight or rain. Since this is a family camping tent, so you must always go for the maximum safety and this camping tent is the way to go. You can get family camping tent for as high as $500 but the good thing is that this 6 person tent will cost you half that amount and offer all the basic and handy features that you can have in an overly priced camping tent. You can buy this Family camping tent from Amazon (with FREE shipping) at a special 12% discount price.